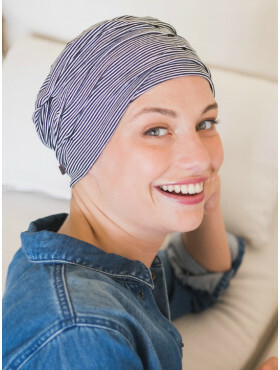 There are not that many chemo scarves out there that are this easy to slip on and also look as gracious and trendy as this Liz cancer scarf in Biscuit. Recommended if you like an elegant style but lack the draping and wrapping skills. Slip it on like a hat, tie the ends once in the nape of your neck and that’s all there is to it! 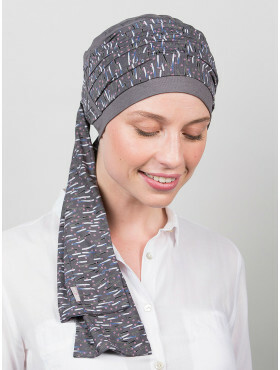 Taupe basic hat with a sewed-on taupescarf with delicate houndstooth print and blue patches.